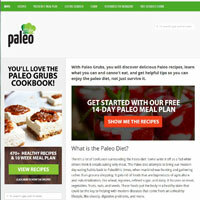 PaleoGrubs is an online resource for anyone wishing to follow the paleo diet. It offers recipes, tips and general guidelines, as well as regular blog posts and newsletters to keep you going. Whilst it might sound like some kind of pre-historic insect guide, Paleo Grub is actually a simple website which provides a space for dieters to explore the paleo way of eating. The premise is simple: eat like a cave man. Not quite so literal as that, of course, you aren’t expected to go out cutting meat from an abandoned carcass, or brawling over berry territory (though you could if you wanted to! ), rather you are encouraged to eat whole foods which haven’t been processed. Of course, it’s easy to be skeptical of a system which promotes a cave-man diet, particularly if it treats that concept too literally. In fact, the site does suggest eating like we might have “100,000 years ago”. In reality, this would mean eating very poorly, irregularly and randomly. But let’s not split hairs here, the diet is really about making tasty foods from unprocessed products, keeping things varied and relatively simple so your body has to work at breaking the foods down. Still, we had to laugh at the free Desserts Ebook on offer, imagining prehistoric humans munching on brownies. There are tips available on how to get started in the paleo diet, plus a range of recipes and diet plans to follow. The recipes all look tasty and healthy, with enough variety to keep things interesting. You can also sign up for a newsletter which gives you new recipes to try out. PaleoGrubs.com allows users to post comments on each recipe, so they can share their thoughts or adjustments. However, this isn’t widely used as many of the recipes have zero responses. It’s a shame, because that could have been a really useful part of the website, much like the system used on other cookery sites. The Learn section of the site explains what the paleo diet is, discusses some of the apparent truths and myths of the diet, as well as foods to try and foods to avoid. If you’re an avid blogger, then you can also take a look at the Resources for Bloggers section, where you can find out how to blog effectively and share your cave-person wisdoms with the world. PaleoGrubs is a free website, but it has no features to speak of really. There are recipes, various bits of information and a few food plans. Otherwise, there are few tools and it lacks even basic extras such as weight calculators or exercises. If you want a few healthy recipes and fancy giving the caveman diet a try, PaleoGrubs is worth a visit. However, its possibilities are limited without further development, so it doesn’t come highly recommended.